Finally we’re happy to announce the details to you, our friends! Tada~! 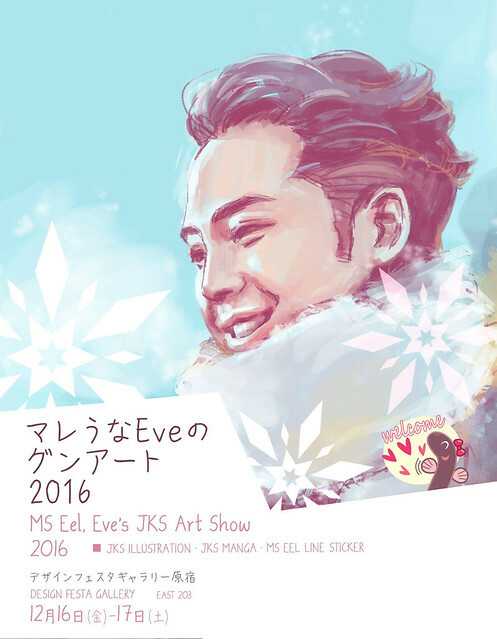 In conjunction with JKS’s additional Team H PARTY 2016 at Yoyogi 1st Gymnasium, Ms. Eve Yap, well-known as a talented artist eel and ECI member & designer, is going to hold her 1st ever art show ‘Ms Eel, Eve’s JKS Art Show 2016’ in Tokyo, Japan! Yay!!! Gallery will be open from 11.00am to 5.30pm? Right. We added the info now. Uh-oh, too bad I cannot visit the unique JKS-inspired art show. 🙁 Are the items for sale at the exhibition? Scrolling down Eve’s FB page, among the items that caught my attention are the Daegil-laptop skin, mug and pouch, guitarist Suk-tote bag, throw pillow and duvet.. May I know where Eve is from, and whether she sells these items at a specific outlet? Who knows, I may be visiting the place she lives during my upcoming vacation. Thank you for taking interest in my works. The items are not at specific outlet, in fact they are print on demand from a website which I post my work on . Please visit https://society6.com/eveyap to have a look . You may like my society6 page to get updated with new post and promotions. Otherwise liking my FB page will do too. Sis!!!!! So this was the surprise..
Omo sis I m actually crying now just seeing the way eels love him selflessly.. Really teary eyed now..
Congratulations Eve sis.. And thanku for organizing this great event..
Eels visiting team h party this time will have a great time watching all ur beautiful fan arts for Sukkie..
Ur works r always great..?? Can Suk know about all these?? He will b very happy.. Thank you for your support and I hope suk will get to know about this too . Let”s pray together. Yeahhhh this will b in news n Suk will know about this.. Praying for this.. It’s a great idea.. very happy n very very proud for this event.. Best wishes for u sis..
Can we buy all these items posted on Eve sis’s FB page?? The bags, t shirts, mugs.. can we buy?? You can get update from liking my FB page. For the products please visit https://society.com /eveyap . Thank you. Sis thanku so much for the info..
Want to buy the Daegil purse n mug..
Will definitely be there to support! love her artwork! Special December for the eels who will be in Macao and Tokio!!! Beautiful!! What a beautiful way to honor our dear Prince!